I hope you've enjoyed the Lil' Inker Designs release festivities this week! The team has one more day of projects to share with you today, sort of a recap of the release! If you are following the blog hop, you should have come from Isha's blog! If you would like to start at the beginning, visit Laura's blog. For this card, I pulled out some fun glittery paper (LOVE!!) to make several different sized balloons. I stamped the string stamp from the new Balloon Builder Stamp Set. Isn't that smallest balloon so cute? I love the different sized balloons you get with both sets of balloon dies! The sentiment is from the Sun Sentiments Stamp set. For this card I used one of the small balloon stamps and the string stamp. Since the string stamp is thin & flexible, I made it wavy so it looked like it was blowing in the wind. I stamped it on the inside of the Instant Camera Die which I had placed on its side. The "pop on by" sentiment is from the new Balloon Builders stamp set as well. Cute! The balloon is die cut from vellum. The twine is Ocean by The Twinery. To continue on in the blog hop, visit Judith's blog! That's all I have for you today! Thank you so much for stopping by and for all the sweet comments you've left! If you comment on this post, you will have another entry into the giveaway for one of two $10 gift certificates to the LID store! Have a great day! Happy shopping! Let's have a party...a mini party that is! 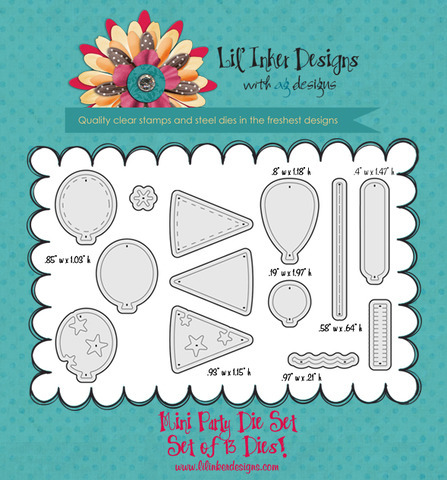 Welcome to Day 2 of the Lil' Inker Design's release! If you are following the blog hop, you should have come from Isha's blog! If you would like to start at the beginning, visit Laura's blog. If you love the balloon and party hat dies from LID, you'll love this new die set as well! It is a mini version of the original die sets! I told you yesterday I'm in a Valentine making mood, so for this cute die set, I created a banner with the Mini Party hat dies and also used hearts from the Of the Heart die set. I added the mini squiggly party hat border as a topper to the banners. For the banner string, I used the balloon string from the new Balloon Builder stamp set and it worked like a charm. The mat is die cut with the Stitched Mats: Rectangle dies. I can't quit using those! They are so perfect for the matting on card fronts! You can see the tiny little squiggly pieces a little more closely here. To adhere them to the banner pieces I used a glue pen. I pulled out a few more LID goodies for the bottom portion of the card as well. I used the Stitched Sentiments Flag Die, the Sentiment Flag Additions Dies (the wavy flag die) and the double ended banner die from Flags & Tags Die Set. I also used the heart again from the Of the Heart set and the sentiments come from the coordinating stamp set Of the Heart (PS...the Of the Heart Stamp Set & Die combo is ON SALE!!). The paper is a wonderful line by Pink Paislee called Secret Crush and the beautiful twine is The Twinery's Platinum Shimmer. Below is a image of what this mini set contains. Lots of tiny cuteness! And, this set also includes a small balloon string die as well! Bonus!! :) And, do you see that long, skinny balloon! I love it! There are a couple of the dies that are the same size as the dies in the original balloon die set, but I found that to be SOOOO handy because I could cut multiple balloons at the same time and didn't have to run them through my die cut machine one at a time. You all know how slow that can go! I'll show you some samples using those tomorrow. Thanks for stopping by today! Don't forget to leave a comment for a chance to win one of TWO $10 gift cards to the Lil' Inker Designs store! To continue on in the blog hop, visit Judith's blog! Hey everyone! 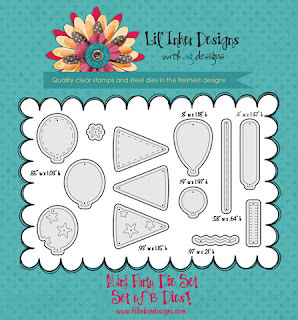 Welcome to the January 2013 Lil' Inker Designs release! We have several new products releasing this month and I am excited to share two of them with you today! If you are following the blog hop, you should have come from Isha's blog! If you would like to start at the beginning, visit Laura's blog. So today's products are all about celebrations! Several months ago, LID released some fabulous balloon dies, now today we are releasing some companion stamps to go along with them! They are so fun! And, there is also a balloon string die too that is sold separately! My first card is soft and pretty. I have the whole Valentine's theme on my mind and went with that color scheme for a birthday card. 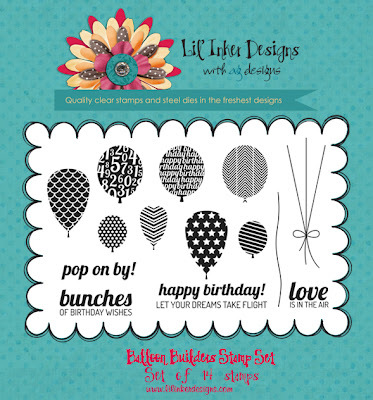 I used four of the new balloon stamps from the Balloon Builders Stamp Set...um, aren't they super cute!? I paired one of the original balloon dies with the new stamps. Love that there is an option like this now! The birthday sentiment is from the Flags & Tags Stamp set. There is a balloon string in the stamp set (actually TWO!) but for this card I wanted to use my sewing machine and stitch the strings to keep with the soft look of the card. I also used my Big Shot machine to impress just a portion of the cardstock. I really like how this turned out! And, then, I tied a little piece of The Twinery's Shimmer Twine through the button. 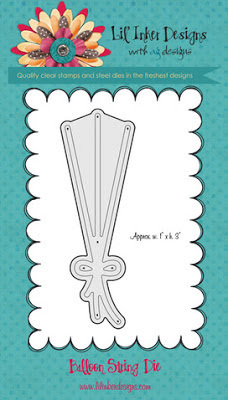 My second card features the new balloon string die and a sentiment that is included in the balloon stamp set. I wanted to use some vellum on this card and the previously released Of the Heart Dies too. 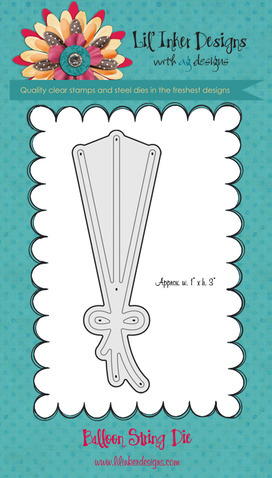 The sentiment, "Love is in the air" just screamed a heart balloon to me, so that is where I went with this card. I used a old page from a book and cut it out with one of the dies from the WONDERFUL Stitched Mats: Rectangle dies. I die cut the balloons from the Balloons Dies and of course used the new String Balloon Die also. There is a little piece of vellum that I punched out at the bottom of the card to mimic clouds. To continue on in the blog hop, visit Judith's blog. She'll share some more items being released this month as well! And, as always, there are prizes up for grabs! The more you comment on the blog posts along the hop, the more chances you have to win! There are two $10 gift certificates to the Lil' Inker Designs store up for grab! Thanks for stopping by today! I'll have new posts on Tuesday and Wednesday this week as well! I have one more card to share today for the AEI♥U card challenge! It is simple, simple! Another one of Avery Elle's sets that I love is the Hello set! It is so cute and so fun! I couldn't resist making a Valentine-like card using it. I paired it again with Platinum Silver Twine from The Twinery. I added a glittery heart on top of some hearts that I stamped and then stamped again second generation using the heart from the Framed Fonts set. The hello tag and the little heart are popped up with dimensionals. Thank you for visiting today! I hope you have a great day! Happy New Year!! It is so hard to believe that 2012 is gone and we are already welcoming in 2013! Time has flown this year! I'm sure that that is partly to blame for the fact that after being a stay-at-home mom for 10 years I'm working part time again (and really enjoying it). I don't have as much time on my hands as I use to but I am so enjoying the opportunities that have presented themselves to me and my family this year. I've spent most of this week cooped up in the house sick and so the plus side to that was that I found my way to my craft table just for the FUN of it! Today I'm going to share two cards using the Framed Fonts set from Avery Elle and the new Shimmer Twine from The Twinery. This first card uses a color combination that I really like but don't bring out very often. I paired it up with twine from The Twinery, including the new Gold Shimmer twine that I can't quit using! It adds just a touch of sparkle that my eye just seems to be drawn to! This next card also uses the same Avery Elle sentiment set, Framed Fonts, but I went in a completely different direction with the look. I love how the sentiments can fit in the frame vertical or horizontal! I used more of the Twinery's Gold Shimmer twine on this card. I also really like how there are several choices of images to put between the arrows! I love being able to change things up. 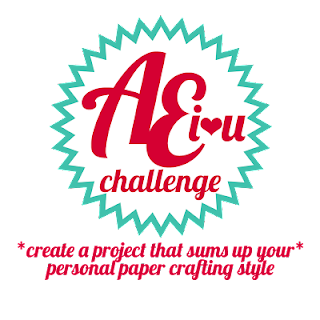 I am entering both of these cards into Avery Elle's new AEI♥U challenge. Thank you for stopping by today! I hope you have a very blessed new year!